Infrared is invisible to human eyes. When using an infrared remote controller, It is difficult to determine whether the remote controller is good or not. 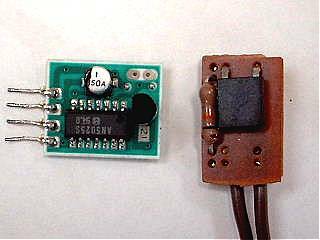 The products to confirm a infrared remote controller is commercially available. But I think it is made so easily. Recently, digital camera comes with the cellular phone. 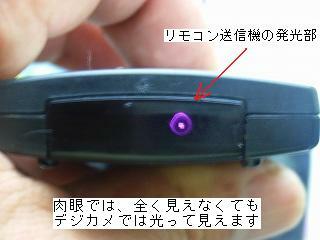 The remote controller can be checked by looking at the emitting area facing towards the camera phone. Left parts are substrates of the light part of the couch commander receiving. Parts on a right edge of this substrate are light detecting elements of infrared rays. The remote control checker made by using this light detecting element is a right thing. It puts in the light detecting element and the resistance of 10kΩ is put in the series. Clip of the lead wire is previously put up. The thing that shape is different from a left light detecting element is used in a right photograph. 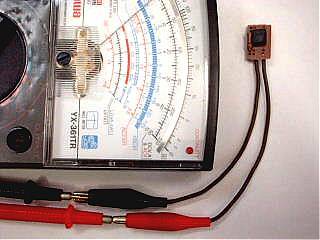 The tester is previously made a resistive measurement and clip leads are connected it. The tester range is set to 1000 times. The polarity of the connection matches the color of clip to the color of the tester stick beforehand as becoming direction where the meter doesn't swing. When you operate the remote control buttons in front of the light-receiving element, the needle moves, the remote control is considered normal. Remote control is made to emit light to check the quality of the remote control transmitter with the digital camera pushing a suitable button of remote control, and it is seen through the digital camera. It seems that it shines in the digital camera with the unassisted eye even if infrared rays is not seen at all. Whether it emits light temporarily when the button of remote control is pushed or it continuously emits light is understood. The digital camera can be similarly used also with the camera of the cellular phone. It is not because the camera has mostly adhered to the cellular phone to making the remote control checker. It is very convenient. As for this method, it is not understood whether the remote control transmitter is up to a quality item. Even if remote control emits light, it is not necessarily trouble-free in remote control. Only whether it emits light is examined, and this method is not understood whether the signal of remote control is normal. The circuit of coming out of the remote control code normally, and the reception part is and there is only examining it compared with normal remote control whether the agreement with the remote control code.